If you are an employer, an owner, a landlord or an occupier of a building or have control of premises, you are known as the 'responsible person' i.e. the safety of whoever is in there, is in YOUR hands. Is your fire extinguisher training overdue? You cannot afford to miss out because if fire sweeps through your building, and you have not covered this vital aspect of fire safety, there will be severe penalties - as well as the loss of your building, plant, machinery or injuries to your workforce. Don't Delay! 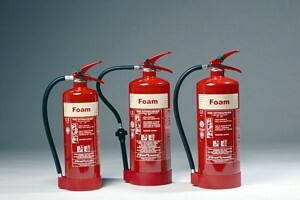 Book Your Fire Extinguisher Training Today! Fire safety training is and require fire extinguisher training for your staff in the Mid Sussex area, we are happy to help. Fire training is a legal requirement for staff and vital as without it your staff will not be qualified or confident enough to operate a fire extinguisher should a small fire break out - which could cost you many thousands of pounds - even six figure sums should people get hurt. When it comes to your fire extinguisher training Mid Sussex firm ETC Fire is here to deal with any aspect of training, inspections, advice and help.